Over the last 20 years Netcetera has grown from it's base at The Dataport, Ballasalla, to become one of Europe's leading datacentre services provider. The company now hosts over 15,000 websites and provides internet services to over 5,000 clients around the world. 2016 will see the company celebrate 20 years of successful business that has been built on customer service, unrivalled technical support and competitive pricing. As the business reaches a new milestone in its history we look back over the last 20 years and ahead to what 2016 has in store for the business. Netcetera has been providing a customer-focused and highly responsive service to both Island based and companies across the globe since 1996. Clients come from various different sectors and range from consumers and small local businesses right up to local Government, e-gaming giants and global banks. In the world of technology much can happen over a 20 year period. Technological changes and improvements can happen in the blink of an eye; Netcetera has always embraced, and invested in new technology, enabling the business to remain at the forefront of a competitive market, and consistently maintain growth. In fact, Netcetera has grown to become one of most trusted, reliable Datacentre service providers with over 8,000 clients in more than 75 countries across the globe. The company’s commitment to its clients has been recognised through various awards and certificates over the years. The business established a reputation for excellent customer care and technical support at an early stage of its development. This reputation quickly gained recognition from global giant Microsoft. In 2000, Netcetera became an approved Microsoft partner, after only 4 years of operating. The company has consistently retained Microsoft Partner status for excellence in customer care and expertise in the provision of business solutions. “Customer care is paramount and is only made possible through having the right staff team in place, it’s at the forefront of everything we do,” says Peter Skelton, founder of Netcetera. In 2006 Netcetera started to develop its current home, The Dataport in Ballasalla, and with a £10 million investment, transformed what had previously been an industrial Diamond production site into a state-of-the-art datacentre. The first hosting hall was opened in 2007, and it didn’t take long for Netcetera to attract global clients to the new facility, which initially provided hosting for 40 racks. Zero Carbon Hosting - Clean and Green! Fast forward to 2013 and Netcetera signed an agreement with the Manx Electricity Authority, to move onto a Green Energy Tariff. This made Netcetera the only 100% green powered datacentre on the Island, and at the time, one of only a small number in the UK. Although the move to green energy came at an additional cost to the business, it was a cost that Netcetera absorbed through its use of more energy efficient technology. Peter recalls the decision to go green, “Although it was a move that was going to increase the costs of the power we consumed, it wasn’t a difficult decision to make. 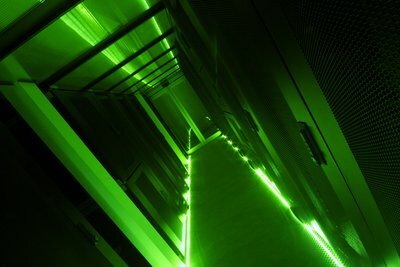 Datacentres contribute to an enormous amount of CO2 emissions globally, and we wanted to ensure that as our clients’ requirements for data hosting increased, Netcetera did not have a negative impact on the environment.” Astonishingly, to date the company has saved well over 1,600 tonnes of CO2 from the atmosphere, and helped clients across the world reduce their own carbon footprint at the same time. Being an energy efficient and a carbon zero company has proved to be an attractive feature for many clients across the globe who are not only looking for a trusted reliable hosting company, but also want to meet their hosting needs responsibly. Netcetera now provides green hosting for well over 15,000 websites around the world. 2015 was another pivotal year in the company’s development. The year began with the opening of its second hosting hall, Zone2, and later in the year the opening of a new Business Recovery Centre. The opening of Zone2 is key to the business’s continued growth. The new hosting hall has the capacity to hold 96 high density racks in various configurations to match the exact requirements of any company that requires hosting. It is also another step forward in furthering the company's commitment to the environment. The new facility uses eco-cooling along with cold aisle technology; this is the same as is used within Facebook’s huge datacentre in Sweden. Unlike traditional cooling systems, there are no chemicals used in the cooling process, it simply makes use of the cool air common to the Island’s climate. On (rare!) days when the air temperature rises, the air within Zone2 is cooled using cold water, bringing the equipment within the hosting hall down to the required temperature. The hall has also been designed in such a way that enables the cool air to be directed exactly where it is needed meaning energy consumption is very efficient. This is another plus for businesses who consider energy usage as an important factor when choosing a hosting partner. Over the last 20 years the company has attended several off Island international trade shows and exhibitions not only flying the company flag but also highlighting to attendees the benefits of establishing a business on the Island. From 2008 - 2014 Netcetera exhibited at the International Casino Exhibition for egaming (ICE) an annual event for the world’s leading online games operators. 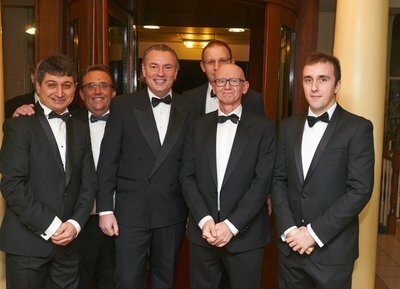 Netcetera’s corporate social responsibility ethos towards the environment was also recognised in 2015 when the business was shortlisted as a finalist within that category for the IOM Newspapers Awards for Excellence. It was a great achievement, considering that it was the first time the company had entered the awards. Netcetera also opened its new Business Recovery Centre in 2015. With the Island being home to some of the world’s leading offshore businesses and many of these businesses working within a highly regulated environment, it was a natural progression for Netcetera to not only be in a position to provide IT recovery and backup but also to be able to provide premises backup. 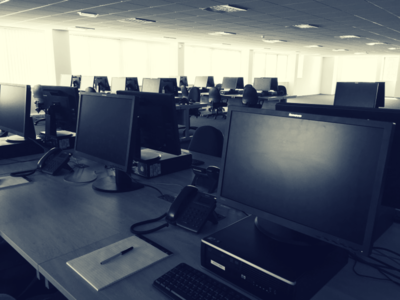 • The new Business Recovery Centre can provide over 100 emergency desk spaces, with a choice of dedicated and shared workspaces including Hot Desks. The new centre has a dedicated manager and is available for use 24/7. Every business that operates within a regulated environment needs to have a ‘plan B’ and Netcetera’s Workplace Recovery solution is situated within The Dataport outside of the Douglas area, and clients who use the facility also have access to private boardrooms, a rest and recuperation lounge with modern kitchen, as well as ample onsite secure parking. • JumpStart, an exciting business and StartUps support programme designed to assist new businesses launch their products and get all the support they need to become successful. Peter continued, “It’s important for the Island’s economy to see the growth of existing businesses as well as new businesses being set up and prospering on the Island. Netcetera is fully supportive of the Government’s new business initiatives and to show our support we have to put together some fantastic packages for people who either want to expand an existing business, or who have a great idea that they want to develop into a viable business. Worrying about IT and websites, can take away from focusing on growing the business. Worrying about a website is the last thing an entrepreneur wants to be doing and this is an area where we can help”. With JumpStart, Netcetera are offering FREE Cloud Server Management worth over £2,000 per year and it also comes with ongoing mentoring and free software from Microsoft up to the value of $120,000. In addition, Netcetera is also providing free use of a Hot Desk within the new Business Recovery Centre, enabling individuals to test the viability of their business prior to committing to costly office space. The year ahead . . . 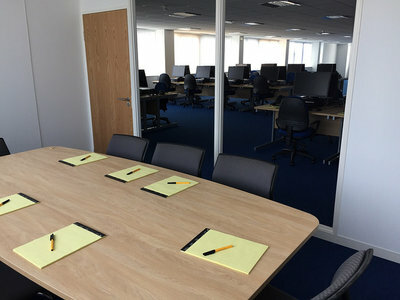 The Business Recovery Centre will be officially opened by the Island’s Chief Minister in January when invited guests will have the opportunity to enjoy Netcetera’s hospitality, networking and the chance to discover more about the power of mindfulness in the modern day office with the aid of Mike Kewley. The centre will also be used for seminars and training events throughout the coming year. In March, there will be a training seminar on digital marketing and social media which will give local businesses the opportunity to join one of the UK’s leading trainers for an invaluable insight into the world of online media marketing.